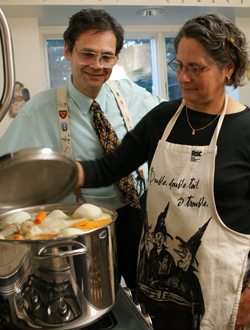 Barbara and Stephen Rennard, M.D., monitor the progress of a pot of chicken soup in their kitchen. Dr. Rennard conducted a study of chicken soup's effectiveness as a cold remedy, results from which have been mentioned in the thousands of news outlets around the world. A study of chicken soup's effectiveness as a cold remedy has made somewhat of a celebrity of UNMC's Stephen Rennard, M.D. Since the results of the study were published in 2000 in the International Journal, CHEST, the Cardioplumonary and Critical Care Journal, the research has been featured in thousands of newspaper, magazine and Internet articles, as well as on television and radio throughout the world. Dr. Rennard found that chicken soup contains a number of substances -- including an anti-inflammatory mechanism -- that could ease the symptoms of upper respiratory tract infections. The suspected benefits of chicken soup in terms of cold relief have been touted for centuries. The Egyptian Jewish physician and philosopher, Moshe ben Maimonides, recommended chicken soup for respiratory tract symptoms in his 12th century writings, which were, in turn, based on earlier Greek writings. But, there's little in the literature to explain how and why the remedy works. A challenge outside of the normal realm of scientific research and curiosity about the long-touted folk remedy first led Dr. Rennard to embark upon a study of the soup's medicinal value. To see a short video about the chicken soup research story, go to www.unmc.edu/chickensoup. In 1993, he conducted an informal laboratory study and submitted the results as an abstract mostly because of its amusement value. On Oct. 17, 2000, his chicken soup research was published in CHEST. Dr. Rennard, Larson Professor of Medicine in the Pulmonary and Critical Care Medicine Section at UNMC, had for years watched his wife, Barbara, cook her grandmother's chicken soup recipe when a cold was going around the family. "She told me the soup was good for colds," Dr. Rennard said. "I've heard that a zillion times. Then I started to think, 'well, maybe it has some anti-inflammatory value.'" Three batches of soup prepared in the home of Dr. Rennard were studied in the laboratory under controlled conditions. Researchers collected neutrophils from blood donated by healthy, non-smoking volunteers. The study focus was to find out if the movement of neutrophils -- the most common white cell in the blood that defends the body against infection -- would be blocked or reduced by chicken soup. Researchers suspect the reduction in movement of neutrophils may reduce activity in the upper respiratory tract that can cause symptoms associated with a cold. Colds are the result of infection in the upper respiratory tract, which causes inflammation. Although colds are not completely understood, it is believed the inflammation contributes to cold symptoms. Dr. Rennard theorized if soup can stop or reduce inflammation, it might reduce the symptoms of a cold. In the laboratory, UNMC scientists diluted the soup and subjected the neutrophils to several variations of the soup. The team found the movement of neutrophils was reduced. "She told me the soup was good for colds. I've heard that a zillion times. Then I started to think, 'well, maybe it has some anti-inflammatory value.' "
The researchers were not able to identify the exact ingredient in the soup that made it effective against fighting colds but theorize it may be a combination of ingredients that work together to have beneficial effects. They found that chicken broth alone does not effectively reduce the movement of the neutrophils. Known as "Grandma's Soup," the recipe Barbara Rennard uses includes chicken, onions, sweet potatoes, parsnips, turnips, carrots, celery stems, parsley, salt and pepper. Researchers noted that "Grandma's soup" has several unusual features. It contains strained vegetables. Dr. Rennard noted, however, that the inhibitory activity was observed with several other recipes -- including commercial brand soups -- that lack the particles from vegetables. "A variety of soup preparations were evaluated and found to be variably, but generally, able to inhibit neutrophil chemotaxis," Dr. Rennard said. "The current study, therefore, presents evidence that chicken soup might have an anti-inflammatory activity." He said the soup also may improve rehydration and nutrition in the body. The psychological and physical comfort soup provides may also have a placebo effect for those who are feeling ill.
Ronald Ertl, who at the time worked as research coordinator of the lung biology laboratory at UNMC, said colleagues working near the lab wondered about the aroma coming from the lab. "It was the only time in my life when I could work in the lab and taste the samples," Ertl said. "The lab shouldn't smell like your kitchen."